Athens: The Greek government faced possible collapse on Tuesday as ruling party lawmakers demanded Prime Minister George Papandreou’s resignation for throwing the nation’s euro membership into jeopardy with a shock call for a referendum. Caught unawares by his high-risk gamble, the leaders of France and Germany summoned Papandreou to crisis talks in Cannes on Wednesday to push for a quick implementation of Greece’s new bailout deal ahead of a summit of the G-20 major world economies. Six senior members of Greece’s ruling PASOK socialists, angered by his decision to call a plebiscite on the €130 billion rescue package agreed only last week, said Papandreou should make way for “a politically legitimate" administration. A leading PASOK lawmaker quit the party, narrowing Papandreou’s already slim parliamentary majority, and two others said Greece needed a government of national unity followed by snap elections, which the opposition also demanded. Euro zone leaders thrashed out Greece’s second financial rescue since last year, in return for yet more austerity, in the hope that it would ease uncertainty surrounding the future of the 17-nation single currency. Instead, financial markets suffered another bout of turmoil on Tuesday due to the new political uncertainty and the risk that austerity-weary Greeks could reject the bailout. Opinion polls show most voters think it is a bad deal. The euro fell nearly three cents against the dollar and the risk premium on Italian bonds over safe-haven German Bunds hit a euro lifetime high, raising Rome’s borrowing costs to levels that proved unsustainable for Ireland and Portugal. “The referendum is a bad idea with a bad timing. The post-summit rally is over," said Lionel Jardin, head of institutional sales at Assya Capital, in Paris. European bank shares dived on fears of a disorderly Greek default and the Athens Stock Exchange suffered its biggest daily drop since October 2008, with the general index shedding 7.7%. European politicians expressed incredulity and dismay at Papandreou’s announcement on Monday evening that took everyone by surprise, including his own finance minister. “Announcing something like this only days after the summit without consulting other euro zone members is irresponsible," Slovak finance minister Ivan Miklos told Reuters. Ireland’s European affairs minister, Lucinda Creighton, whose own country is struggling through an EU/IMF bailout programme, said last week’s European summit was meant to have dealt with the uncertainty in the euro zone. “And this grenade is thrown in just a few short days later," Creighton said. “Legitimately there is going to be a lot of annoyance about it." In a statement after French President Nicolas Sarkozy and German Chancellor Angela Merkel conferred by telephone, Sarkozy’s office said: “France and Germany are determined to ensure, with their European partners, the full implementation in the quickest time frame, the decisions adopted at the summit, which are today more important than ever." The renewed uncertainty is bound to embarras G-20 host Sarkozy as he tries to coax China into throwing the euro zone a financial lifeline. It could also further undermine dwindling political support in northern Europe for aiding Greece. Dutch Prime Minister Mark Rutte told parliament in a letter his cabinet was concerned about the risk of delay and uncertainty. Business executives in Greece expressed despair at how the country was being run and markets speculated on whether Italy will be the next euro zone country to slide into a debt crisis. “I think by late evening this saga will have come to an end because he (Papandreou) will have lost the slim majority that he has in parliament," Athens Chamber of Commerce head Konstantinos Michalos told Reuters Insider television. “This referendum will not happen. I’m hoping and praying for a government that will join other political forces." The chairman of euro zone finance ministers, Jean-Claude Juncker, said Greece could face bankruptcy if voters rejected the bailout package. Papandreou, whose party has suffered several defections as it pushes waves of austerity through parliament despite mass protests, said he needed wider political backing for the budget cuts and structural reforms demanded by international lenders. But the conservative opposition called for snap elections. “Elections are a national necessity," opposition New Democracy party leader Antonis Samaras told reporters. PASOK lawmaker Milena Apostolaki quit the parliamentary group, reducing Papandreou’s strength to just 152 seats out of 300 deputies before a vote of confidence later this week. 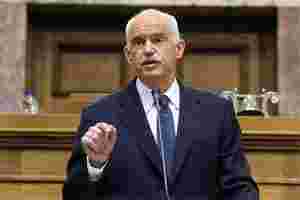 Fellow PASOK lawmaker Vasso Papandreou, who is not related to the prime minister, asked the Greek president to work for a national unity government to ensure Athens receives the rescue funds, followed by early elections. Papandreou did not even inform finance minister Evangelos Venizelos he was going to announce the referendum on the latest EU aid deal, a government official told Reuters. “They must be crazy... this is no way to run a country," said a senior executive of one of Greece’s biggest firms, speaking on condition of anonymity. One senior German parliamentarian suggested the euro zone might cast Athens adrift, cutting off its aid lifeline and allowing the nation to default on its huge debts. “One can only do one thing: make the preparations for the eventuality that there is a state insolvency in Greece and if it doesn’t fulfil the agreements, then the point will have been reached where the money is turned off," Rainer Bruederle, floor leader for the Free Democrats, junior partners in Merkel’s centre-right coalition, told Deutschlandfunk radio. On the markets, players scurried for safer investments, hammering stocks and punishing the euro. The FTSEurofirst 300 index of top European shares was down almost four percent, due not only to the possibility of a hard Greek default but also to Europe’s inability to stop the debt crisis spreading to bigger economies such as Italy. Banks exposed to Greece and Europe’s bigger, troubled economies, suffered most. Shares in France’s Societe Generale tumbled 17 percent and Credit Agricole was down almost 12.5%. Greece is due to receive an €8 billion tranche in mid-November, but that is likely to run out during January, around the time of the referendum, leaving the government with no funds if there is a “no" vote.